Millions of fans are waiting to find out the latest installment of the Batman saga, titled Batman: Arkham Knight. But many are seriously threatened to spoil the surprise. If you don’t want to risk any spoilers, do not read any further. The online retailer Amazon, in its page dedicated to the title, reported the Limited Edition (pictured below). Nothing strange except that, where now read the writing on the base of the statue "The Gotham Knight", appeared instead "From a Grateful City In Memory of the Gotham Knight." There is not much room for doubt: Batman at the end of the game dies? To confirm this hypothesis appears just below another inscription: "an imposing memorial statue of the patron of Gotham Batman, the Dark Knight." We don’t know what the truth is and we will not know until the game will be released on June 2. 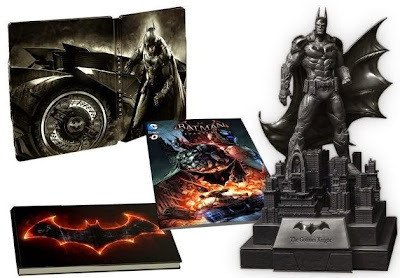 The fact is that, aware of the spoiler, Amazon has now eliminated any reference by replacing the simple picture of the Limited Edition in which only appears the inscription "The Gotham Knight". Meanwhile, however, the network was already full of spoilers.